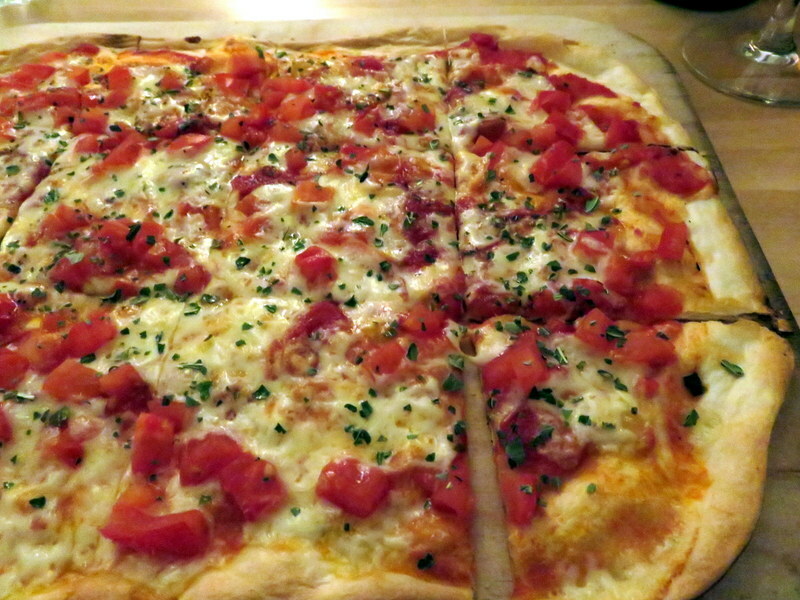 Swiss pizza, who’d have guessed? We were in Chur overnight to take the UNESCO World Heritage Bernina Express through a very scenic section of Switzerland. 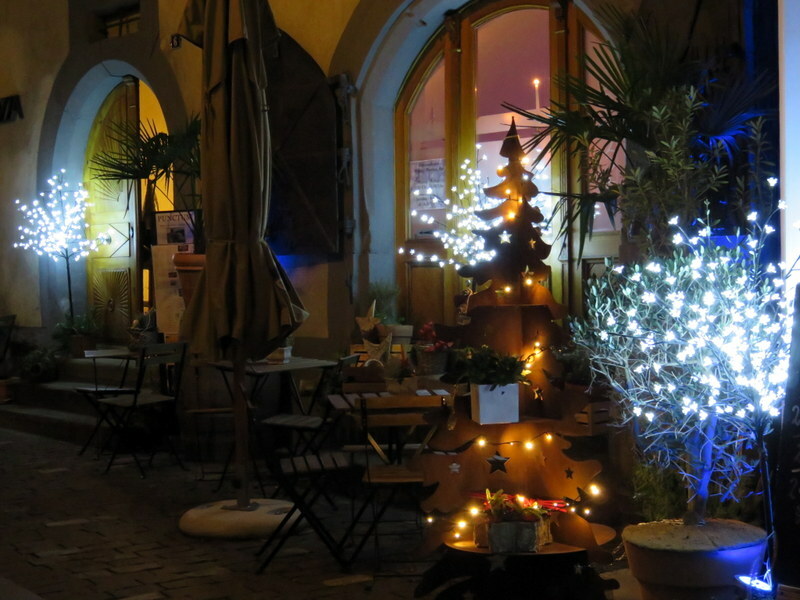 We identified Punctum, a cute aperitivo place, during an afternoon walk, intending to have just that: un’aperitivo, meaning a glass or two of wine and some light bites. Upon perusing the menu, those snacks did not thrill us so we turned to the pizza menu. Did we really want to do this in tiny little Chur? Cute entrance to Punctum. In summer, there’s outdoor seating. We pondered the choices, a dozen classic rosso (red/tomato-based) varieties, and a page of “specialties” that sounded like pizzas but were not called such (the menu was in German! ), and which featured crème-fraiche. I queried the waiter, first by asking if he spoke English. He made the little rocking motion with his hand to say “so-so.” I asked the difference between the two pages of pizzas. “These,” he said, pointing, “are no tomato, with sour cream.” Huh? Indoors, serene, a little cave-like, but cozy. Thus, we discovered our waiter, in tiny Chur, was an Italian who misses Italy and his Roman girlfriend very much. He presides over a place that turns out a fine, very thin crust, tasty pizza. Wow, was it good! Unfortunately, the pricing is Swiss and that means costly. It’s not the exchange rate, but the actual price in local currency that can cause heart failure. 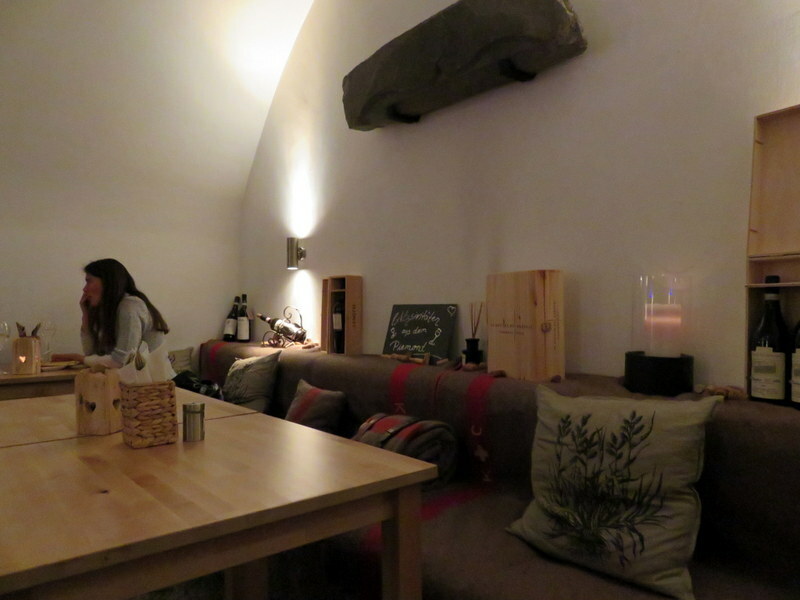 A half-litre of wine was CHF 30.00, about US$30.00. That’s for 500 ml, 2/3 of a bottle. Italy has ruined us: It might have cost US$12.00 in Italy. Total for 2 pizzas and the wine? CHF 75.00 with a small gratuity. So if you are passing through Chur on your way to-or-from the Bernina Express, stop by Punctum in the Alt Stadt and have yourselves a fine Swiss pizza, but bring a lot of Swiss francs. 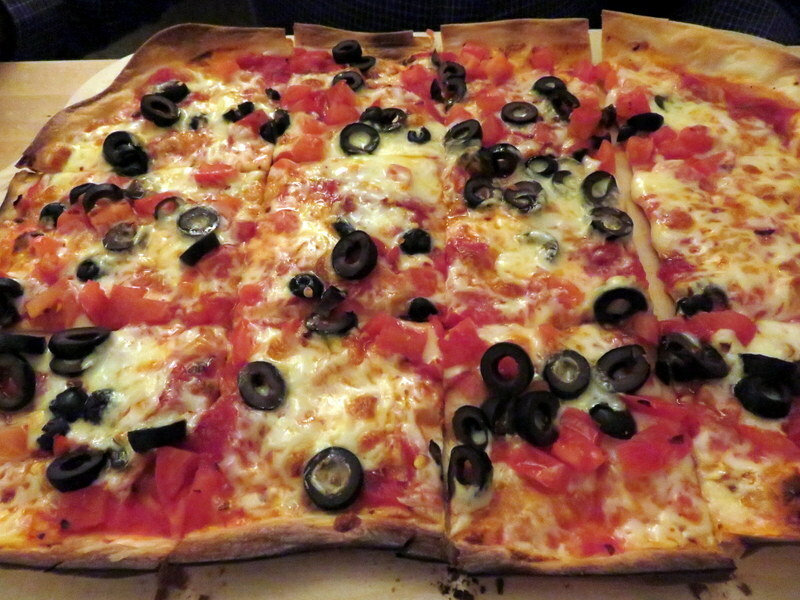 Ric’s pizza, simply black olives and peperoncini. They were out of arugula. Pizza Quality: 2 Very thin crust, like a cracker it was so light. High-quality ingredients and nicely seasoned. Not wood-fired so cannot, in my book, be a 3. Service: 3 Delightful and in the European manner, only as intrusive as you want it to be. If you want to chat, the waiter is willing. Otherwise, you are left alone. Ambiance: 3 Cute, almost cave-like but light. Three distinct rooms break it up and diminish what could be ricocheting noise if the place is full. A few outdoor tables in the pedestrian zone would make a fine place to hang out on a summer evening. My simple choice: fresh tomatoes and basil, a variation on a Margherita. So no two prices – for tourists and for locals (or Italian speaking) – them eh?